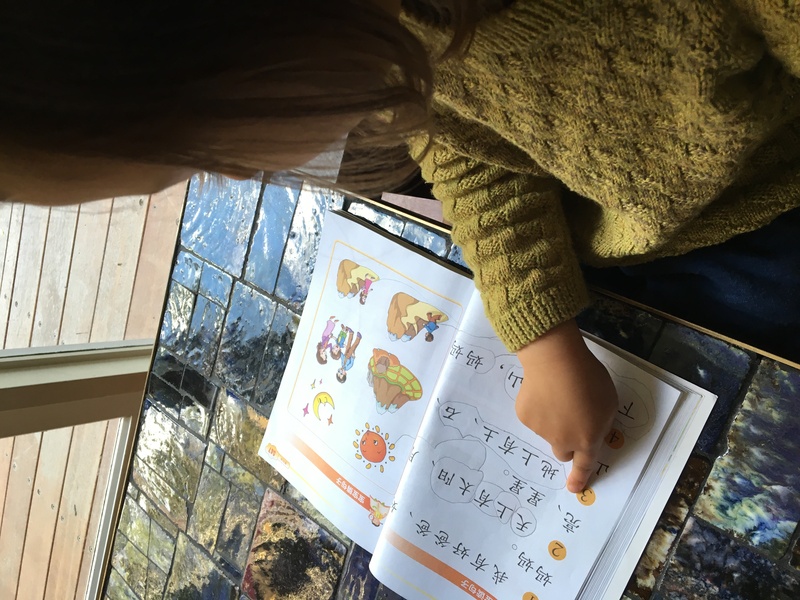 Trilingual Family | Raising Our Child In Chinese, French, and English. In The Wild World. Nina’s language pattern has seen a dramatic evolution in the last three months or so. About the time when she turned 4.5 (three months ago), she totally switched her language preference at home. Up till that point, she would speak Mandarin with me, and French with Nicolas, 100%. Then one day, suddenly, she switched to English, 100%. Just like that. Nothing had changed at home: I still used only Mandarin when speaking to her, Nicolas only French. The only plausible explanation is that her English had finally caught up through her pre-primary schooling experience. Perhaps she felt confident and more comfortable to express herself in English. Perhaps she started to have more English vocabulary than in Mandarin and French. Anyway, although we were a bit shocked and puzzled initially by the sudden change, we acknowledged that it was something to happen sooner or later. After all, many experts say that most of us need one dominant language, and that usually is the one that the child is schooled in. However, we continued to speak Mandarin and French respectively with her at home. She would understand totally and reply in English. So officially we had three languages all spoken at home, for the first time since she was born. Then two months down the road, things started to change again. She started to speak Mandarin with me again. Initially only when I invited her to, but fairly quickly she would initiate conversation with me in Mandarin. However, she continued to speak English with her dad, even though Nicolas never switched to English. It got to me think why. Then I found one, and perhaps only one possible, explanation. I invited Nina to speak Mandarin with me, after about one month following her switch to English. Sometimes I would just casually say: ‘I would love to hear you speaking Mandarin with me’, or ‘Could you say it in Mandarin please?’. Sometimes I just repeated what she said in Mandarin. Sometimes I needed to help her with a particular vocabulary. Sometimes I would make a fuss ‘wow, I love how you said that in Mandarin – it’s perfect!’. Don’t get me wrong – I never pushed her. If she continued with English after I reminded her, I didn’t insist her switching to Mandarin. I knew it would have only pushed her to be rebellious. I never pretended that I didn’t understand her – because she knew that I understood English perfectly so there was no point to lie (and I didn’t want to teach her that lying was ok). I would happily carry on the conversation, even if she chose to reply only in English. For me, the fact that we are communicating is still much more important than in which language we communicate. But I persisted. I carried on reminding her – about twice or three times a day when I felt she’s receptive. I continued to praise her efforts – every single time that she made an effort and spoke in Mandarin. I remained relaxed. I focused on the quality of our communication rather being frustrated by it not happening in Mandarin. Then I noticed her throwing in more and more Mandarin, two months after her switch to English! Initially she would say something only upon invitation or being prompted. Then she started to initiate conversation in Mandarin. It’s now three months after her switch to English. She’d use Mandarin when speaking with me about 2/3 of the time. And it’s definitely trending positive. Sometimes even in tantrum, she would speak Mandarin! I consider that pretty good (minus the tantrum part!). In comparison, she hasn’t really switched back to French as much, yet. She’d still speak just English with Nicolas, up till about two weeks ago, when I had a conversation with Nicolas, sharing my observation and my technique of ‘inviting’ Nina to speak Mandarin. Nicolas just never really invited her to speak French up till that point of time. Nicolas since then has started to use the same trick – reminding her, inviting her, repeating in French, helping with her vocabulary, and praising her efforts. And I’m happy to report that Nina has started more French when speaking with Nicolas. I am hopeful that we would hear more and more French from her too. Invite your child to speak your language – it really works! 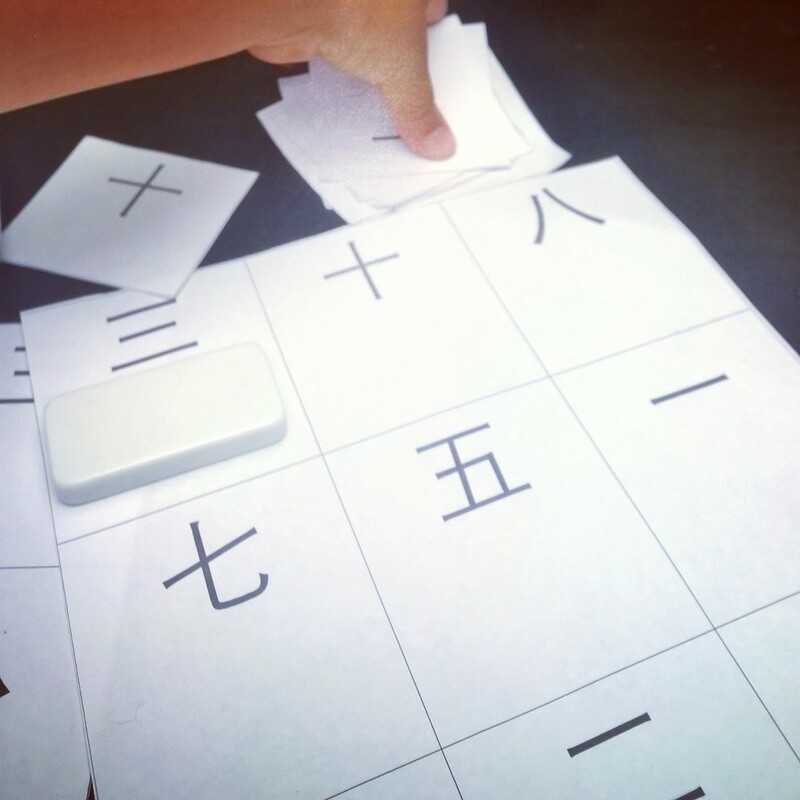 I am embarking on a new venture – creating reading and writing materials in Chinese for Nina! Who would have thought of that ? So I figured she’s ready to learn how to read. This is validated when I went for an observation at her pre-school earlier this week – she was playing the number bingo and letter bingo games again and again with her classmates. They are the very basic version of bingo games created by her Montessori directress – number bingo is when one child calls the number from one to ten (Arabic numbers), and other children need to see if they have the same number on their 3×3 sheets (with just one random number missing). Whoever gets all 9 numbers will shout ‘bingo’. Amazingly kids seem to all enjoy that again. So I created the Chinese Number bingo game at home. It’s really easy to make. In word, I created a 3×3 table on an A4 page, each cell with a random Chinese number between 一 (1) and 十 (10). I created 3 such tables (so up to three person can play at the same table, but i can easily do up more for mor players). Then I also type all 10 characters separately. I printed out all 4 pages, cut the 10 individual characters into smaller individual pieces. Voila, ready to go! Nina had a blast playing. She particularly wanted to be the one calling the numbers out. Or when she plays, she gets herself two pieces of pages and look for the called number on both pages. She has recognized eight of the ten characters, but funnily was still trying to figure out six (六）and nine (九). She asked why the 6 & 9 ay school would look the same if one is turned upside down, while the ones in Chinese won’t! This game can be easily adapted to introduce learning to read any characters in any languages really. I already started to think of other characters that will be easy and fun and useful enough to get onto that 3×3 magic table. I saw this standing in front of an op-shop today on my way to the train station. I couldn’t help but stop to take a snapshot. 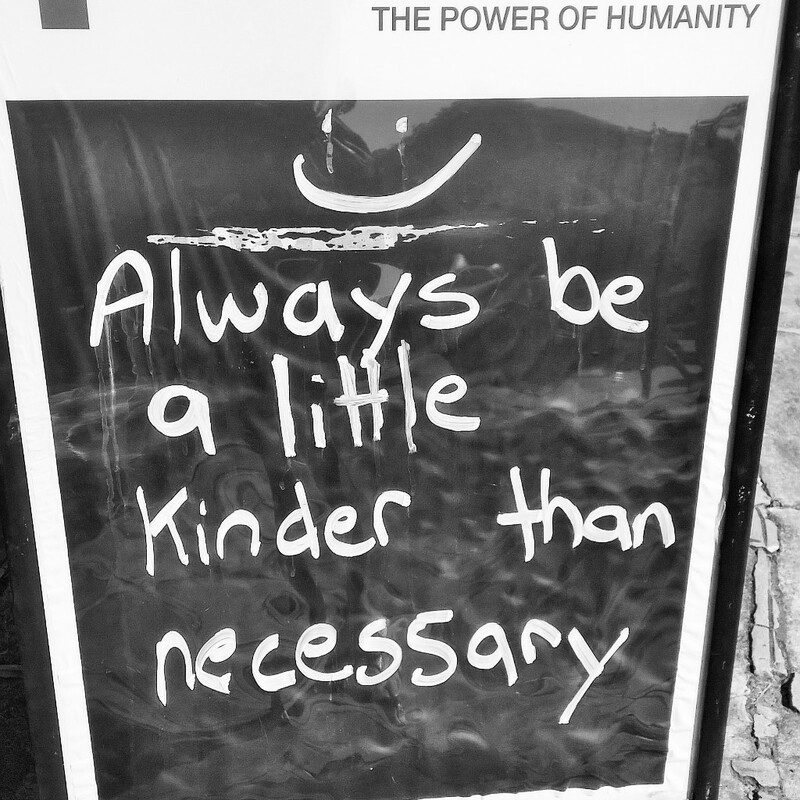 In a world that sees some senseless crime, we need to be kind and a little kinder to other human beings. In a world that puts so much pressure on others and ourselves to be successful, to be the best, to be achieving, to be fast, to be efficient, and to be everything, we need to be kind and a little kinder to others and to ourselves. In my sometimes seemingly confined world of trilingual parenting that I often feel a lousy parent, I need to be a little kinder to myself. There are amazing similarities between parenting and starting up a new business. Here are 10 things that they share in common. 1. There is no user-manual that guarantees the proper function and the success. 2. Everyone will have an opinion. 3. Your routine suddenly changes, dramatically. 4. No one pays you. For a potentially long time. 5. It’s a 24/7 job. No sick leave. No paid holiday. 6. You often wonder, how come I work so hard but I’m still doing such a lousy job? 7. The support from the partner and family makes it so much easier. 8. You need to take a break, even if it’s difficult to arrange. 9. It’s a lonely journey, as most of time you don’t even know where to start to explain. 10. You’ll never fully know what it’s about until you actually start the job.